Did you know that cranberries are actually not a carb-bomb??? You did? Well why the heck didn’t you tell me??? 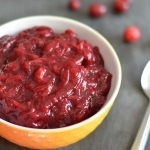 Granted there is a cranberry sauce recipe here on Bariatric Foodie, penned by my former co-author, the incomparable Jen and featured in The Bariatric Foodie Holiday Survival Guide. But I’d always avoided the stuff because…I don’t know. I assumed it was going to be too carby for me. That’s what I get for not following my own advice. Always read the label! If you read the label, you’ll find that 1/2 cup of cranberries is like 35 calories, 6 grams of carbs, of which 2g are dietary fiber. Jigga-what??? So that means that all I have to do to have “low-carb cranberry sauce” is control what I put into it? Yeah. We got this, Foodies. 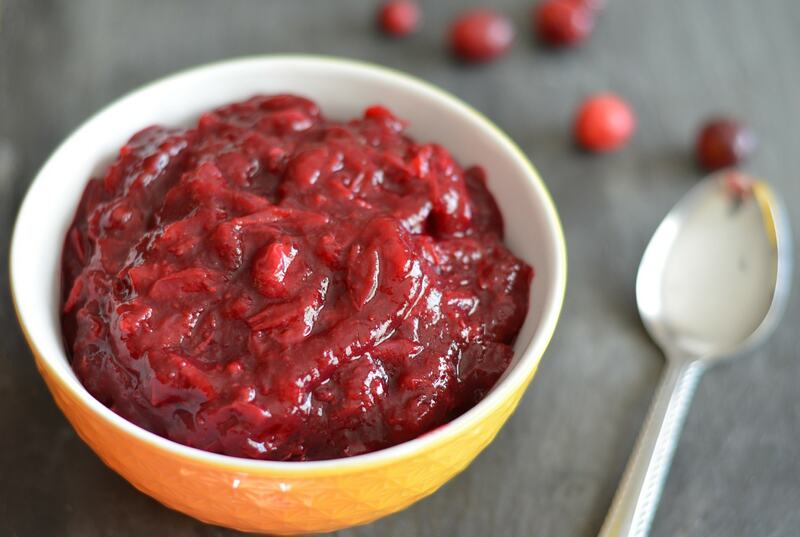 Plus…cranberry sauce is crazy, ridiculous, stupid easy to make. Like…it’s one of those foods that is so easy to make you have to wonder why anyone buys it. Well…maybe not. I mean we eat it during Thanksgiving when we are cooking a gamillionty-seven other things and I can see outsourcing the cranberry sauce. Ok, so I take that back. I can see why some folks buy it. But seriously. It’s so easy to make! Let’s go over the basic methodology. It all starts with these guys. Cranberries. 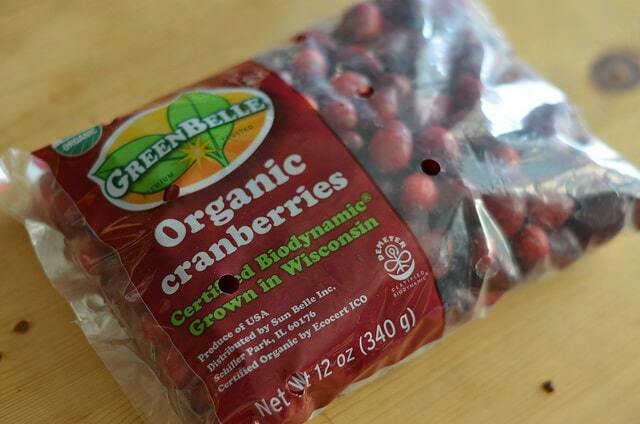 Note that you don’t need organic cranberries. But I tested this recipe out before my regular supermarket got cranberries in stock so I had to go to Whole Paycheck, er Foods to get some. Any old cranberries will do. 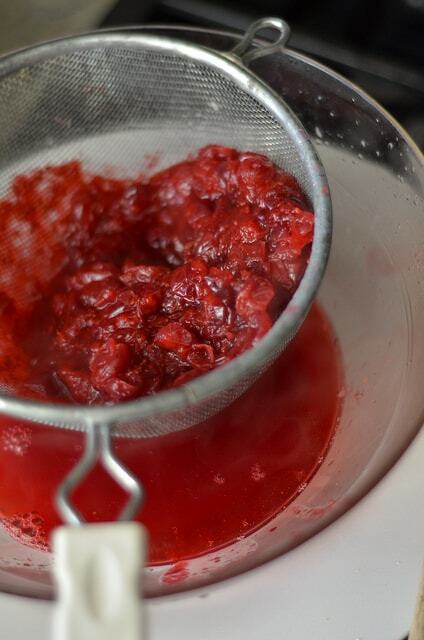 The important thing to remember is that you should rinse your cranberries in a colander and give them a once over. Pick out any that are shriveled, soft or that aren’t red at all. There shouldn’t be many of those, but if there are, pick ’em out! Anyhoo, after you’ve looked over your cranberries (or, actually you can do this beforehand), you want to add your BiPro Protein Water (either Lemon Lift or Peach Power works…the cranberries sort of overtake both flavors) along with your sweetener. Notice the recipe calls for “no-calorie sweetener equivalent to one cup of sugar.” That means…check the website for your favorite sweetener. They all have conversion charts! Most sweeteners measure 1:1 with sugar (Splenda does) but double-check to be sure, k? So you wanna bring the protein water and sweetener to a boil and make sure it’s all dissolved (with most no-calorie sweeteners – even monkfruit and stevia – there will be bubbles…pay no attention to that…it’s the bulking agents in the sweetener…). You’ll want to reduce your heat to low and then add your cranberries. So here’s where if you’ve never made cranberry sauce before you really, really need to heed my advice. Because if you do not…and you end up messing up your stove…it is not my fault! Biggest piece of advice: Do not leave this pot of cranberries alone. Because if you do, what will happen is that they will come to a boil, they will bubble over the top of your pot, and they will spill onto your stove. Doesn’t sound too bad, right? Well at this point it’s on it’s way to being “saucy” so it crystalizes and hardens super-quickly and it is HARD to get off of your stove! Bottom line: stay near the stove. Oh yes, I forgot to tell you that I also added some lemon zest in there. Orange zest works great too. Citrus fruit tends to make other fruit taste…fruitier. When reading up on cranberry sauce online I also read that you can put cinnamon or even pie spice in it to make it more fallsy. So play around with it! SPOILER ALERT: If you choose #2 by itself it’s not going to be that wonderfully unnatural curiosity you buy in the store. It will never get that firm. To get it that way you’d want to add unflavored gelatin to the mix. I prefer a more natural cranberry sauce so I don’t do that. Mkay…moving right along! Once it’s at that point, you need to remove it from heat. (I usually transfer it to a plastic bowl with a lid or you can go for a glass bowl…plastic doesn’t conduct heat well, though, so it’ll cool faster.) Allow it to cool ALL the way down. Like…all the way down. As in, you feel the bottom of the bowl and it doesn’t feel even a little bit warm. Yeah. That. So that will take an hour or two. Which is why you may want to make your cranberry sauce a few days ahead of the big day. From there, stick it in the fridge and voila! 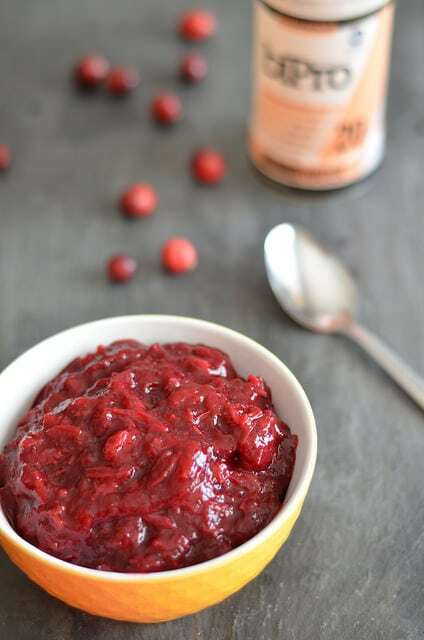 You’ve got yourself some protein-infused cranberry sauce! And you didn’t add a cabillion carbs. Aren’t you proud of yourself??? 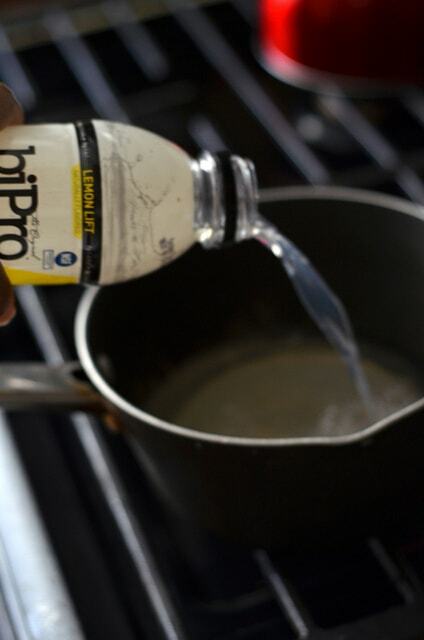 Give your holiday cranberry sauce a little protein kick with BiPro Protein Water! This method is super-easy, low-carb and delicious. Add protein water and sweetener to a pot. Bring to a boil and then drop to a simmer until sweetener is dissolved (with no-calorie sweeteners, there will be bubbles and that's ok). 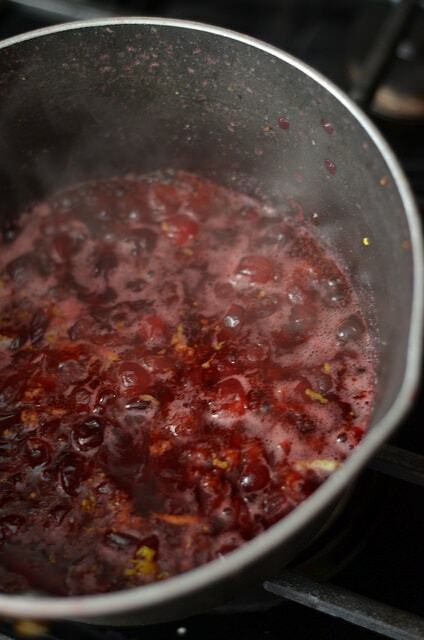 Add cranberries, cover and bring back to a boil. Immediate drop heat down to a simmer to avoid the liquid boiling over onto your stove. Continue to cook on low heat until liquid thickens considerably (usually 15-20 minutes). Remove from heat and allow to completely cool in a container. (This usually takes 1-2 hours.) Refrigerate 2 hours before serving. Follow instructions #1 and #2 above, then cook cranberries an additional five minutes after dropping the the heat down. 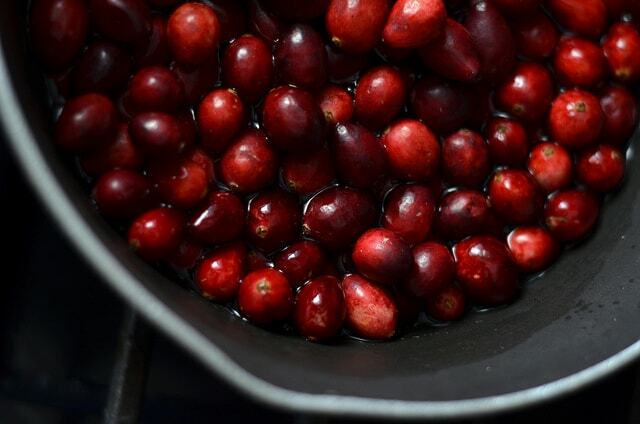 Set a strainer over a bowl and pour your cranberries and liquid into it. Use a wooden spoon to mash all the liquid out of the skins, scraping the underside of the strainer often. Return the liquid to the pot and continue to cook on low heat until it has thickened considerably (about 20-25 minutes). Remove from heat and put into a container. Allow the liquid to cool all the way down (this usually takes 1-2 hours). Refrigerate at least 2 hours before serving.